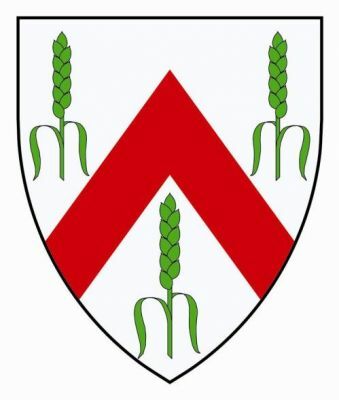 Arms: Argent a chevron gules between three ears of rye slipped and bladed vert. Source for blazon: page 1162, Burkes Landed Gentry, 19th Edition, Scotland. Sir John Charles Buchanan Riddell of Riddell, 13th Baronet, CVO, JP, FRSA, was born in 1934 and s. his father in 1934. His ancestor, the first Sir John, was created a Baronet of Nova Scotia on 14 May 1628, with a grant of lands there to be denominated “ Barony and Regality of New Riddell” in his own father’s lifetime. The current Baronet is Lord Lieutenant of Northumberland.